As Google Reader, the most popular online RSS feed reader, has gained significant functionality over the last year, including new gestures for content and the ability to share items with social networks, the mobile version of the site has lagged somewhat behind. Today, Google, on what has obviously been a big day of news for the Mountain View company, updated the mobile version to be more in line with the Web content. I have been using the new interface for a few weeks, since mid-December, and it is much improved. Limited to what is clearly a much smaller screen than the rapidly expanding desktops most of us are used to, Google Reader Mobile is trying to accomplish more tasks in a lot less space. Added today include the option to "like" items, tag them and sort feeds from oldest or newest. 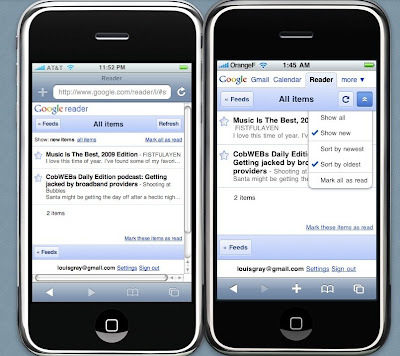 Previously, the mobile version had two major items: "Mark All as Read" or the simple "Refresh". Google Reader Mobile (Before on the Left and After on the Right) from December. The upgrade makes Google Reader mobile much more of an option to get feed items while using any smartphone, but there is still room to grow before it reaches parity with the desktop equivalent. For example, the mobile version is missing the "Sort by Magic" functionality introduced this October, letting you find the best feeds just for you. I've been using my6sense (a company I advise with Paladin) for this functionality, while relying on Google Reader Mobile to view all feeds in total. Noticeable changes with the new mobile UI include the main header's change, where you can easily get access to Gmail or Calendar with a single click , and larger fonts, in general, to make clicking the right buttons with your small fingers on these small displays even easier. Also added today, on the Web side, is Reader's move toward "recommended sources", which you can find in the "Explore" section of Reader, under "People you follow" and above "Subscriptions". It's a good way to find new feeds that could be a match for you. The team summarizes the new features in a blog post on their Web site issued this afternoon. Disclosure: my6sense, an assumed competitor to Google Reader mobile, is a client of Paladin Advisors Group, where I am Managing Editor of New Media. My comments on the company's product are always independent, and do not pass their way in advance.